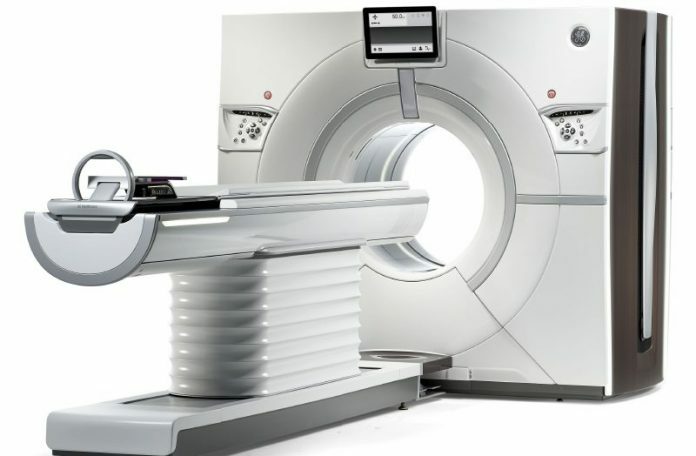 GE Healthcare continues to invest in the Revolution family of CT systems which are built out of its passion to enable technologies that allow you to reach the right diagnosis, effortlessly. Each product in the Revolution family is designed to deliver four key benefits: diagnostic confidence, patient care, financial performance and clinical excellence. By designing with patient and health care provider needs in mind, Revolution family of CT scanners are scalable to meet imaging needs today and tomorrow. Revolution CT is designed to bring unique capabilities to improve the clinical excellence of CT imaging including diagnostic confidence of image acquisition, cutting edge applications with advanced capabilities through the convergence of whole organ coverage, speed, image quality and spectral imaging all in one CT system. Revolution CT with GSI Xtream is the first volume spectral CT technology designed to improve small lesion detection, tissue characterization and metal artifact reduction, with a simplified workflow you can make part of your daily practice. The entire GSI (Gemstone Spectral Imaging) experience has been enhanced from scanning to reconstruction to visualization. Enabled by innovations such as Gemstone Clarity detector, volume coverage and fast kV switching, only GE can deliver this breakthrough. GSI Xtream helps you diagnose disease with more confidence, which could ultimately put patients on the right treatment path sooner.